As the Toronto Transit Commission’s King Street Pilot hits the one-year mark, its fate is uncertain. Data shows an 11% increase in public transit ridership and a 13% per cent decrease in cars in the downtown core; this increase in ridership indicates that the pilot is working for commuters. For TAF, we support the Pilot as a demonstration of streetcar right-of-way routes, which can reduce emissions as part of a wider TTC Ridership Growth Strategy. But is it working for the rest of the community? The King Street Pilot started in November 2017 as an innovative solution to improve transit reliability, speed, and capacity. From Bathurst to Jarvis Street, the pilot prioritizes streetcars by banning private vehicles through its intersections. Here are the top three ways the King Street Pilot contributes to a more livable downtown. Did you know that transit users walk 19 minutes a day, compared to only six minutes by those who drive? While a few minutes might not seem significant, it can add up over time. This op-ed by Dr. Steven Hoffman from the Canadian Institute of Health Research, highlights the connection between greater transit access and healthier people. Moreover, air pollution from vehicle exhausts is an increasing global concern according to the World Health Organization. Cleaner transportation and increased public transit use are important steps to improve air quality in our cities. The Everyone is King design competition encouraged artists, architects, and students to brighten up King Street with artistic, temporary street furniture. Public art brings excitement and joy to our urban environments – encouraging tourism and more foot traffic for local businesses. Additionally, creative public seating goes one step further and improves the accessibility of our transit routes and cities. This is a great step towards greater accessibility for transit users and residents with mobility issues, since many transit stations (and streets in general) often lack adequate seating. Here are some of the fun and whimsical public seating on King Street. Time is money – and so the Ryerson City Building Institute wanted to calculate the value of the time savings generated for transit riders. From their research, the King Street Pilot demonstrates how better transit can save commuters approximately $11.5 million a year in terms of time. In Toronto, congestion carries an estimated cost of $3.3 billion in lost time for Toronto commuters. The pilot saves us money through reduced wait times and shorter commutes, as well as other economic benefits like job creation. With improved health, cooler street art, and cost savings, the King Street Pilot has been a success in my books. Is the pilot working for you? 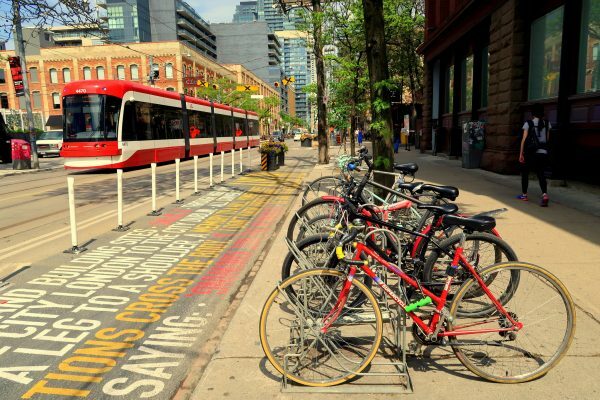 Monday, Nov. 26: TTCriders is hosting a public consultation about the King Street Pilot. Here’s your opportunity to share your thoughts and show your support for the King Street Pilot. In early November, they also held a Twitter chat; see what people said at #KingStreetPilot. The King Street Pilot has actually INCREASED my travel times on TTC on adjacent routes, by 10-12min each way, due to increased traffic volume on those streets, which has been pushed off King St. There is only one adjacent route to the 504 and that’s Queen 501. Whatever you believe, north south routes would not be affected by the King pilot. And if you’re relying on the Queen streetcar, my thought sod go out to you. But soon enough it’ll get the King treatment, too, which will save the 501 route.. The City underfunds the TTC, so as a consequence there are not enough streetcars operating on the 501 Queen route. Hence people are relying more on cars & Ubers to get around, causing congestion. The King Street Pilot moves many more people, more efficiently, and is a model for other Toronto arterial streets. The decision was already made when they called it the King Street pilot project we all knew that this was not going to be temporary. So why are we pretending now?